We are kicking off the first week of Camp Mathematics with a simple, quick and fun counting game. This math game looks deceptively simple but it exercises kids’ logic and reasoning skills. It’s a good early math activity in preparation for addition and subtraction but I played a few rounds with my soon-to-be 5th grader and he enjoyed beating me (ahem). Best of all, it’s quick, takes no prep time and is easy to learn. 11 stackable counters. 10 in one color and 1 in a different color. 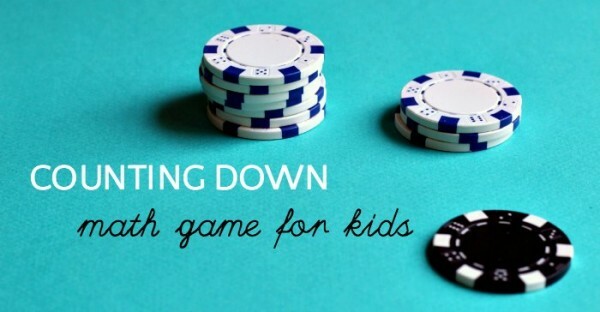 We used black and white poker chips, (affiliate link) which are extremely handy if you play a lot of DIY games at home (don’t worry, my kids are not gambling). You can also use checkers, or even flat blocks. Objective: to force your opponent to pick up the black (the last) chip. Stack the white chips on top of the black chip. Determine who will go first. 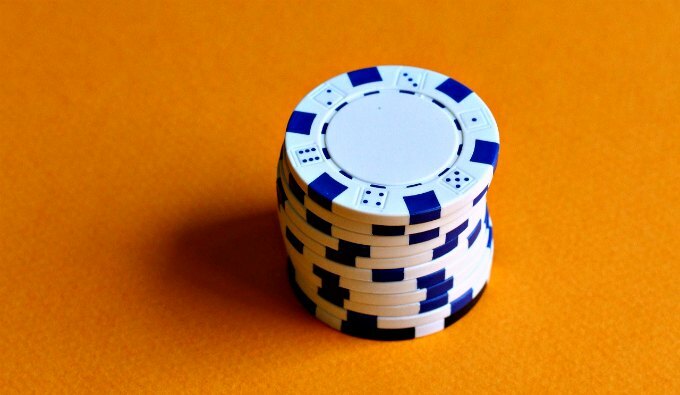 Taking turns, players picks up 1, 2 or 3 chips from the top of the stack. Whoever is left with the last chip loses. TIP: You don’t necessarily need different color chips. You can play with 11 chips and whoever is stuck with the last one, loses. TIP: After 1 or 2 rounds kids will see that in order to win they need to leave 4 white counters on top of the black one. If they are able to do that, it becomes impossible for their opponent to win. This will lead to some strategizing and you can start to vary the game rules to tickle their little brains even more (see below). Is it better to go first or second? What number of white chips do you ultimately want to leave on top of the black one so your opponent can’t force you to pick up the black chip? Counting backwards practices the skills needed for subtraction. They are learning to think strategically. They are using their reasoning skills. They are learning to plan ahead (games like this build executive function). 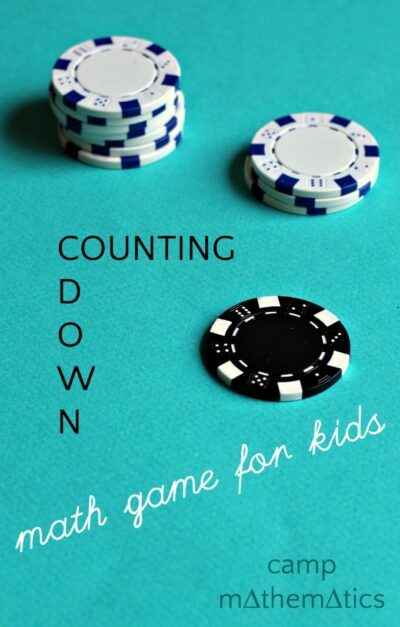 Got any other simple counting games your kids love? See more of our favorite math activities in action! This is the first post in a 6 week series. Last year Megan at Coffee Cups and Crayons and I teamed up to bring you a DIY Summer Science Camp and this year we are bringing you 12 fun and easy math activities to do with your kids this summer. Each week will will focus on a different aspect of math. This week we are looking at counting and quantity. Visit Megan’s post because she is showing you how to make an abacus! Love this idea and am eager to try it with my daughter–thanks! Lise, I am so sorry! Those kind of ads are supposed to be blocked but once in a while one sneaks in. I agree with you, they are extremely annoying!!!! One thing you can do if you come across one here or on another website is to reload the page, that will make different ads come up in the space. Once again, I am sorry, but thank you for taking the time to tell me so I can try to get that one blocked, too. Thanks, Erica. I don’t want to be a grump. I really enjoy reading your blog! p.s. it’s gone today; hooray! I will try the reload trick next time I encounter something like that. Simple and engaging. My 7 year old enjoyed this game. I was able to sit down and play while also teaching her something. It didn’t take too long and was rewarding for us both. She now has a trick and always leaves 4 chips on her 2nd to last turn! LOL. Thank you so much for the post. I’m glad it worked out for you. I love finding simple but effective activities.